If this one is booked, be sure to check our other townhomes in Le Jardin. See VRBO listings #554936 & #644021. 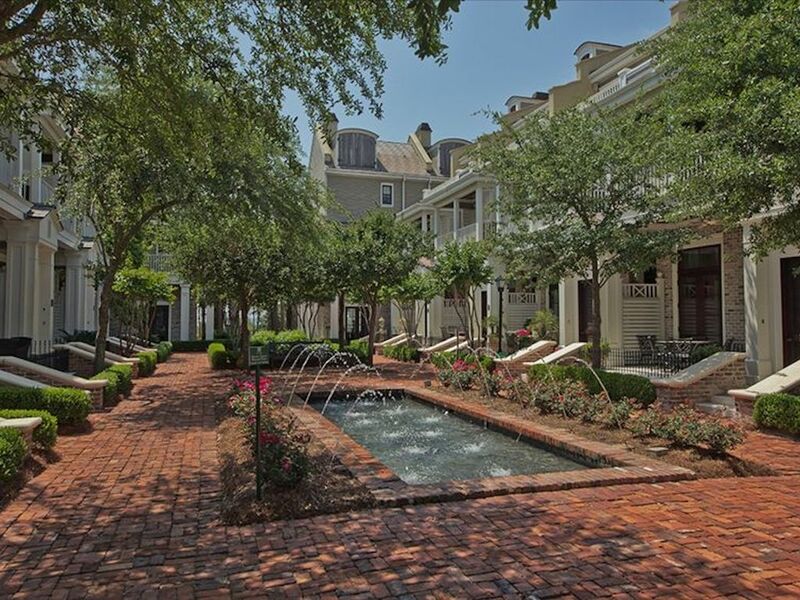 Le Jardin is conveniently located right in the heart of the village of Baytowne Wharf, a self-contained village with world class restaurants, shops and nightlife right outside your door. Our beautiful 3-story townhome is professional decorated and well equipped. We even have Wi-Fi internet, along with a high chair and porta- crib for your little ones. Walk into the main level and the first thing you’ll notice is the soaring 12 ½ -foot ceilings with crown molding and 2 sets of double French doors. You’ll also find an expansive living room with large Travertine tiles, comfortable family room furniture, including a queen sleeper sofa, for lounging and relaxing. If you’re the type who enjoys curling up on the sofa to watch your favorite TV shows or catch a game you’ll find our large HDTV (yes even HD service from Cox cable) hidden behind a beautiful imported armoire. You'll also find a powder room on the main level. Our kitchen is a cook’s dream. Bring out the your inner Emeril Lagasse or Julia Child with our professional Dual Fuel Viking Stove and Convection Oven, Sub Zero Refrigerator, wine cooler and Cuisinart cook ware. Make your morning coffee with our Cuisinart Grind and Brew coffee maker or if you prefer, walk 100 feet to local coffee shop to get your favorite morning coffee. We, of course, have a fully equipped kitchen with all the necessities such as a toaster, microwave, mixer, blender, ample plates, glasses, wine and beer glasses and kitchen utensils. And we even have a supply of spices, sugar, creamer, aluminum foil, etc. The dining room features an extra-large square dining table and 8 chairs. Located on the second floor, the King Master Bedroom has with 10-foot ceilings with crown moldings, a King bed with Egyptian Cotton sheets, TV, ceiling fan, reading lamps, large closet, iron and ironing board and a shared attached balcony (with bedroom Jr. Queen Master). The attached bathroom is equipped with double vanity, Ralph Lauren towels, blow dryer, tub & shower combo and separate commode room. Also located on the second floor, the Jr. Queen Master Bedroom features 10-foot ceilings with crown moldings, a Queen bed with TV, ceiling fan, reading lamps, iron and ironing board, large closet, and a shared attached balcony. The bathroom is accessible from the hallway and features a tub and shower, Ralph Lauren towels, and blow dryer. Located on the third floor, the King Master Suite features 10-foot ceilings with crown moldings, a King-size bed with Egyptian cotton sheets, a double-sided Fireplace, TV, DVD player, ceiling fan, reading lamp, iron and ironing board, and a private balcony with Views of the Bay! Reserved, designated parking inside Baytowne Wharf. HDTV service in living room. Sandestin Gateway Pool, 2 hot tubs, gas grills, work out facility, beautifully landscaped.